Neil Patrick Allen was born January 24, 1958 in Kansas City, Kansas. 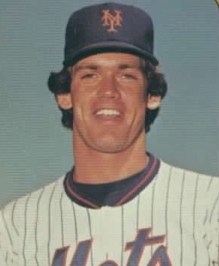 The six foot three right hander was selected by the New York Mets out of Bishop Ward high school in Kansas City, Kansas in the 11th round of the 1976 draft. 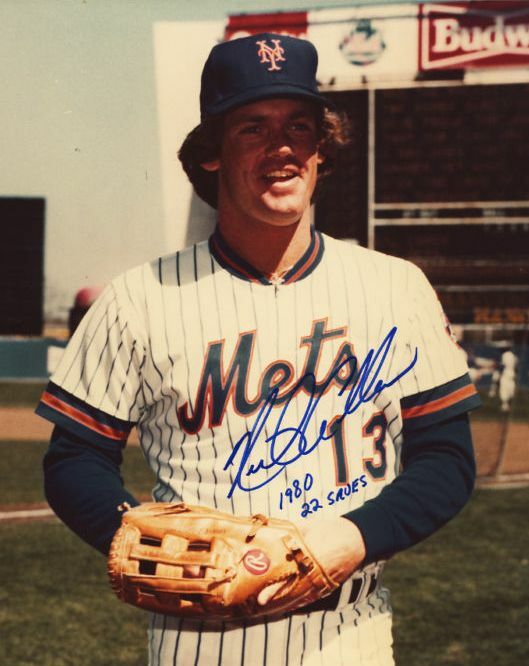 In 1977 at A ball, with the Lynchburg Mets, Allen was 10-2 with 126 strikeouts & a 2.79 ERA. The next year he was brought up through the ranks going 7-16 but posted a strong 2.79 ERA, getting a promotion to the Mets staff for 1979. He made his debut on April 15th, 1979 against former Met Nino Espinoza & the Phillies, 1979 and took the loss while giving up four runs. Allen struggled as a starter losing his first five decisions, two to both the Phillies & Dodgers as well as one to the San Diego Padres. By July he was put into to the bull pen and found a new home. From there on in he had four straight winning decisions & five saves before taking another loss in mid August. He would finish up 6-10 with eight saves, second on the team to Skip Lockwood & a 3.55 ERA. In 1980 he got the save against the Chicago Cubs to start the season on Opening Day in relief of Craig Swan in front of just 12,000 at Shea Stadium. He finished April with four saves a loss & two blown saves, with an inflated 8.22 ERA. He then had a good May saving five games with two victories. In that month he he only allowed three earned runs in 17 innings. On June 4th he pitched three innings of relief but the one hit he allowed was the game winning HR to St. Louis Ken Reitz. Three days later he pitched three innings again, this time a Ron Hodges walk off RBI single got him a win. He also had a strong August with five saves and a 1-1 record. He would save a career high 22 games on the season (4th in the NL) going 7-10 with a 3.70 ERA striking out 79 batters in 97 innings pitched. In the 1981 strike shortened season, he saved 18 games (3rd best in the NL) going 7-6 posting a 2.97 ERA, while becoming one the league’s best closers. At the same time Jeff Reardon was also developing into a fine relief pitcher on the same Mets club. The Mets were trying to improve their team by shopping for a good hitting outfielder. The Expos were willing to trade star outfielder Ellis Valentine but wanted one of the Mets young reliever’s In return. The Mets chose to give up Reardon, at the end of May he & Dan Norman were sent to Montreal for Valentine. 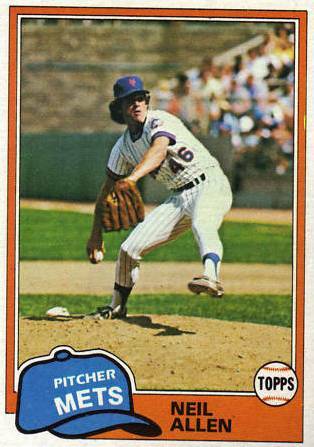 Allen remained with the Mets & started out 1982 with a good April posting five saves not blowing an opportunity until the end of the month. He finished out May with 13 saves & 2.03 ERA. At the All Star break he had 17 saves but the rest of the season didn’t go as well, he finished with a 3-7 record 19 games (6th in the league) while posting a .306 ERA. 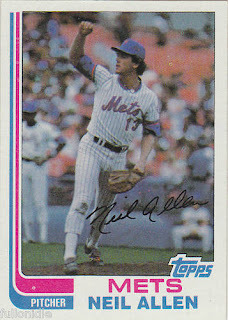 In 1983 after a 2-4 start with a two saves & a blown save the Mets converted him back to a starter. 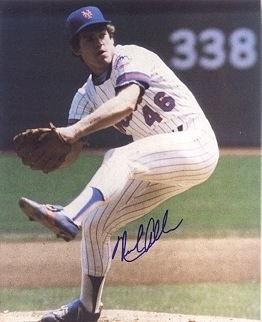 Allen made his first start since 1979 against the San Francisco Giants at Shea Stadium on May 25th allowing five runs in 4 innings of work. His next start in San Francisco wasn’t much better as he allowed another four runs over 4.2 innings of work. He went 2-7 with an ERA over four into June, but was still considered a good young pitcher with a great future. Meanwhile the new Mets ownership were hard at work trying to make a big deal behind the scenes. 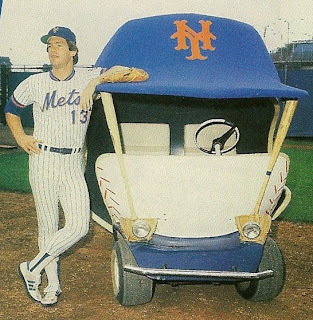 As the St. Louis Cardinals, Whitey Herzog & Keith Hernandez were having their issues, a deal was worked out with New York. On the trade deadline of 1983, Allen was sent to the 1982 World Champion Cardinals (along with Rick Ownbey) for All Star Keith Hernandez. What a deal for the Mets, one of their best ever. At the time of the trade the Mets were playing the Cardinals & Neil Allen had a two strike count on a hitter when a rain delay came. The next time the two teams faced off, the rain delay was picked up, Allen was now pitching for the Cards & struck out the Mets batter who was filling in his old spot in the batting order with two previous strikes on him. You can say Neil Allen is the only player in history to strike himself out. Mets Career: In his five year Mets career Allen pitched in 223 games (21st on the Mets all time list), going 25-40 with 69 saves (8th on the Mets all time list). He struck out 285 batters, walked 179 in 381 innings while posting a 3.54 ERA. Allen made his first start for the Cardinals against the Mets at Busch Stadium a few days later. He was spectacular pitching eight innings of shutout ball allowing just four hits while striking out six. He pitched well for the Cards, including back to back shut outs in July against the Dodgers & Padres. He finished the year at 10-6 in St. Louis going 12-13 overall (8th most losses in the NL) with a 3.94 ERA. His three shutouts were 5th best in the NL, & his eight wild pitches within the top ten most. In 1984 he was 9-6 & was put back in the bullpen for the 1985 season. Allen struggled & wasn’t as effective as he was in the past. The Cardinal fans let him have it and he was traded to the AL New York team mid season. Over the next three seasons he would bounce from the Bronx to the South Side of Chicago & pitch for the White Sox. In 1986 the White Sox put him back in a starting role & in May against his old AL New York team mates he pitching a four hit victory against Ron Guidry. Next month he tossed a two hit shutout against them in New York as well. He went 7-2 that year with a 3.82 ERA. He finished his playing career in 1989 with Cleveland going 0-1. In his 11 year career he saved 75 games with a 58-70 record and a 3.83 ERA in 434 games. He struck out 611 batters with 417 walks in 988 innings. 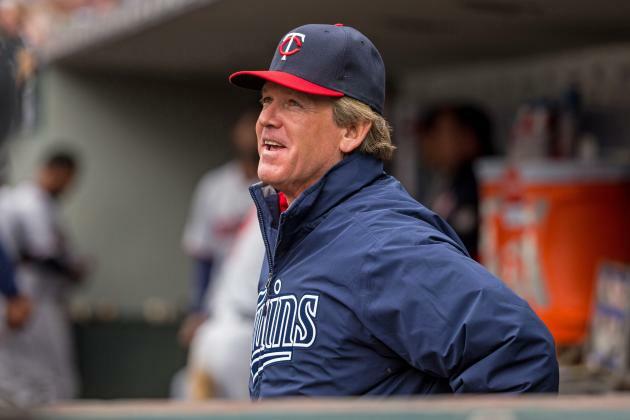 Retirement: Since his playing days Allen has been a pitching coach in the minor leagues. He was with the Toronto Blue Jays organization (1996-1999) then the Staten Island A ball (2000) Columbus Clippers (2003-2006) spending one year with the AL New York club as bullpen coach (2005). He then spent a year (2007) with the Durham Bulls for the Tampa Rays. 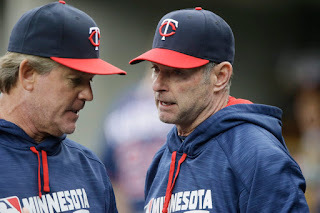 In 2014 Allen was named pitching coach for the Minnesota Twins, spending four years there in that position. In his time in Minnesota he had a DUI in 2016, completed a five week out patient treatment & was back to work for the Twins. He was released after the 2017 season.